Unbalancing application or throw. The closest in judo would be Obi-otoshi. 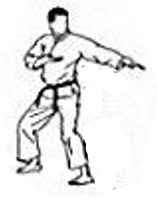 The sequence begins with the opponent holding your left wrist with his own left hand. Move round to the left of the opponent. Step and 45° behind the opponent's legs with your own right leg. The downstroke of the barai pushes him backwards over your front right leg.